Find cheap color contacts using coupons and our advice on the best value colored contact lenses. A few years ago, the only colored contact lenses you could buy were expensive custom-made theatrical lenses, most often worn by actors. But the big optical retailers soon realised there was a big market for colored lenses, whether wild crazy contacts for special occasions like Halloween, or everyday colored lenses for people who just want to look a little different. 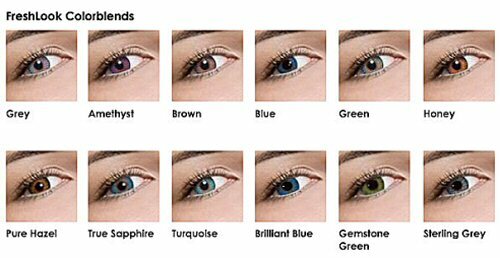 Today, there are many brands of discount colored contact lenses available and they can be worn either by people who normally wear clear lenses to correct their vision, or by people who purely want to change their eye color. Like the highly popular Freshlook Colorblends, soft disposable contacts available in 12 different shades as seen below. They cost just $29.95 per box of 6 lenses and are designed to be worn for up to a month, so if you only wear colored lenses a few times per week, provided you clean and disinfect your cheap color contacts carefully after use, each pair of lenses could last for months. NB: As a comparison, most clear soft disposable contact lenses range between $20-$30 for a box of 6 lenses and many of these can only be worn for 2 weeks. So colored contacts are as cheap as clear lenses. Acuvue 2 Colours from $29.95 per box - available to ENHANCE or CHANGE your eye color. Expressions Colors - which offer the most natural eye color due to advanced technology at $35.95 per box. Freshlook ONE-DAY - the only daily disposable soft contact lens currently on the market. Priced at just $14.95 per box of 10, this is an ideal colored contact lens to try at a very low cost. Whether you need to use contacts for vision correction or just for cosmetic purposes, there are plenty of cheap colored contact lenses to choose from and all the above lenses are available in both prescription and non prescription form. Just order a power of 0.0 (zero) to get non prescription contacts that won't affect your vision. Be sure to use any available coupon codes like these from AC Lens to get the best possible price when ordering. See our page on coupon codes to check all available optical retailer coupons. Even if you have a complicated prescription, there are affordable cheap color contacts on the market like Freshlook Colorblends Toric, for patients with astigmatism and there are even multi-focal colored contacts on the market, although choice is very limited at present, mainly as lenses have to be custom-made. Tip: While price may be your main criteria for choosing a particular brand of contact lenses, only buy from reputable optical retailers like AC Lens, Discount Contact Lenses or Vision Direct, as these companies only stock FDA-approved lenses that are safe for consumers to wear. Cheap color contacts from companies offering lenses as fashion accessories are often operating without FDA approval and offer poor quality contacts made of thick plastic that could harm your eyes.